His Highness the Aga Khan and Prince Aly Muhammad at the Global Centre for Pluralism, accompanied by Ismaili Council for Canada President Malik Talib and Farhad Mawani, Project Manager for the renovation of 330 Sussex Drive. Photo: The Ismaili/Moez Visram. His Highness the Aga Khan, Mawlana Hazar Imam, arrived in Ottawa this afternoon, accompanied by his daughter Princess Zahra and youngest son Prince Aly Muhammad. Soon after their arrival, they visited the Global Centre for Pluralism, and were given a tour of the building by John McNee, Secretary General of the Centre. Tomorrow, May 16, 2017, His Highness the Aga Khan and His Excellency the Right Honourable David Johnston, Canada’s 28th Governor General of Canada who assumed office in 2010, will welcome distinguished guests to the official opening of the new permanent international headquarters of the Global Centre for Pluralism (GCP) located at 330 Sussex Drive in the nation’s capital. During the event, the Governor General will deliver an address on the importance of pluralism and the role the Centre and Canada can play as leaders in this globally significant issue. His Highness the Aga Khan is greeted by His Excellency the Right Honourable David Johnston at Rideau Hall, in Ottawa, on October 7, 2010. Photo: John W. MacDonald, Ottawa. 330 Sussex Drive: The permanent international headquarters of the Global Centre for Pluralism, all prepared and set for the opening on Tuesday, May 16, 2017, at 10:30 am. Simerg/Nurin and Malik Merchant. 330 Sussex Drive, another view: The permanent international headquarters of the Global Centre for Pluralism, all prepared and set for the opening on Tuesday, May 16, 2017, at 10:30 am. Photo: Simerg/Nurin and Malik Merchant. Located immediately to the south of The Global Centre for Pluralism is Canada’s National Art Gallery. This shot was taken from the gallery’s parking driveway entrance. Photo: Simerg/Malik and Nurin Merchant. The back part of the Global Centre for Pluralism building. Photo: Simerg/Nurin and Malik Merchant. Founded in Ottawa by His Highness the Aga Khan in partnership with the Government of Canada, the Global Centre for Pluralism is an independent organization. Inspired by Canada’s experience as a diverse and inclusive country, the Centre was created to advance positive responses to the challenge of living peacefully and productively together in diverse societies. As long time residents of Ottawa – I was born and raised in Ottawa some 24 years ago; my dad, Malik, has lived in the city since the early 1980’s – we decided to offer our readers an interesting pictorial insight into what surrounds the newly restored Global Centre heritage building that is being officially inaugurated today by the Aga Khan and the Governor General. The building was formerly the Public Archives of Canada (1905-1967) and the Canadian War Museum (1967-2005). This will be of interest to our world wide readers who don’t know much about Ottawa’s ceremonial street, where the Global Centre is situated at 330 Sussex Drive! For a general panaromic view of the historic building (last photo, below) and to put it into perspective with other important landmarks we crossed the bridge over the Ottawa River to Jacques Cartier Park in Gatineau, Quebec. The river separates the Canadian provinces of Ontario and Quebec. Sussex Drive is denoted by the yellow line. Going East, you start at Rideau Street (blue line) where the 700 Sussex Condominium building is located. Between Rideau Street and #35 on the map, you pass the Connaught Building (550 Sussex) and the US Embassy (490 Sussex). The National Gallery of Art (380 Sussex) and the Basilica (385 Sussex) as well as Reconciliation Monument are located at or around #35. Then just a hundred metres east of #35 are located the Global Centre for Pluralism (330 Sussex), the Royal Canadian Mint (320 Sussex) and the Embassy of Kuwait (333 Sussex). The Saudi Embassy (201 Sussex) and the Delegation of the Ismaili Imamat Building (199 Sussex) are at #36, with the Lester Pearson Building (125 Sussex) and the John G. Diefenbacker or the Old City Hall (111 Sussex) approximately 100-200 metres further east. 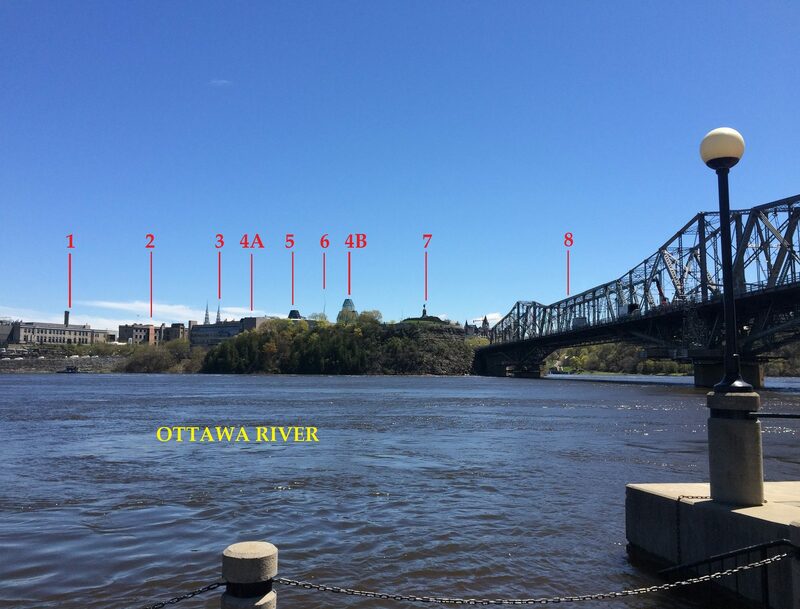 At #37 you reach Rideau Falls Park (50 Sussex) and the French Embassy (42 Sussex). Finally, Sussex Drive winds down (or starts if you are travelling South!) at #38, the residences of the Prime Minister (24 Sussex) and the Governor General (1 Sussex) as well as the High Commission of South Africa (15 Sussex). Map credit: The National Capital Commission (with minor edits by Nurin Merchant to represent Sussex Drive more clearly). Located immediately north to the Global Centre for Pluralism is the Royal Canadian Mint shown above. Photo: Simerg/Malik and Nurin Merchant. The National Gallery of Canada, with the huge spider sculptor dominating the front side. The Gallery is just a few metres south of the Global Centre for Pluralism. Photo: Simerg/Nurin and Malik Merchant, Ottawa. School children from different backgrounds enjoy a break together during their visit to the National Art Gallery. Photo: Simerg/Nurin and Malik Merchant. An unnamed sculpture with Major Hills Park behind it, and the Parliament of Canada in the distant, about a kilometre away. This picture was taken from the front of the National Art Gallery where the spider sculpture is exhibited. Photo: Simerg/Nurin and Malik Merchant. Designated a National Historic Site of Canada in 1990, the Basilica is the oldest and largest church in Ottawa and the seat of the city’s Roman Catholic archbishop. It is less than 200 metres from the Global Centre for Pluralism. It is pictured from Major Hill’s Park where tulips are in abundance for the annual tulip festival. The Basilica’s twin spires and gilded Madonna are easily identifiable from nearby Parliament Hill and the surrounding area. Governor General Georges Vanier and Prime Minister Sir Wilfrid Laurier both were given state funerals at the Cathedral. Photo: Simerg/Nurin and Malik Merchant. Statue of French explorer Samuel de Champlain at Nepean Point in Ottawa. The explorer is seen holding his famous astrolabe upsidedown. Nepean Point overlooks the Ottawa River, Parliament, the Canadian Museum of Civilization, and other features of downtown Ottawa and Gatineau. It is located between the National Gallery of Canada and Alexandra Bridge. The sculpture was made by Hamilton MacCarthy in 1915. Photo: Simerg/Nurin and Malik Merchant. A monument celebrating Canada’s contribution to peace and reconciliation, less than 200 metres away from the Global Centre for Pluralism. Photo: Simerg/Malik and Nurin Merchant. Around 400 metres to the north of the Global Centre is the Delegation of the Ismaili Imamat Building. It is one of the most popular buildings visited during the annual “Open House Weekend” when several landmark buildings in Ottawa are open to public at large. Photo: Simerg/Malik and Nurin Merchant. Royal Canadian Mint, the Global Centre for Pluralism (centre, with flag) and twin spires of the Basilica seen from Jacques Cartier Park. Photo: Simerg/Malik and Nurin Merchant. A panoramic view of the Delegation of the Ismaili Imamat and the Global Centre for Pluralism from Jacques Cartier Park, Gatineau. Photo: Simerg/Nurin and Malik Merchant. Panorama from Jacques Cartier Park in Gatineau, Quebec: (1) Royal Canadian Mint; (2) Global Centre for Pluralism; (3) Basilica; (4A and 4B) National Art Gallery; (5) USA Embassy (top mast only); (6) One Hundred Foot Line Sculpture; (7) Statue of French explorer Samuel de Champlain at Nepean Point; (8) Alexandra Bridge over Ottawa River connecting Ottawa (north side) to Gatineau; and Ottawa River. Photo: Simerg/Nurin and Malik Merchant. Please click to enlarge. Last updated: May 21, 2017, 10:52 PM. Excellent work done By His Highness the Aga Khan. World should follow in his footsteps as his work is always for mankind. Thank you again for sharing what will impact the world peace in a great way inshallah. You are certainly blessed to be the one to help spread news of Mawla’s grace in Canada and around the world. Mubaraki to all. What an accomplishment and so beautiful. We are so proud of our Hazar Imam. l am delighted to read this happy news. Hopefully the Aga Khan’s work and effort on pluralism will be understood well by everyone. Today the world is divided, where neighbours with different interpretations of the same faith do not wish to talk to each other. This is not the spirit of Islam and we have to set examples by coming together and I hope that the idea of pluralism will be enhanced through this initiative that is being taken. Another milestone by Hazar Imam for the good of Ismailis and humanity at large. Congratulations. Thank you so much Malik and Nurin for sharing this with excellent photography of Ottawa with its iconic buildings including Global Center for Pluralism. Gosh it is a sheer joy to read and appreciate and be grateful to our 49th Hazar Imam for his incessant and tireless initiatives for the world peace. Truly, this calls for Nobel Peace Prize!. Excellent work Malikbhai. Please enlighten us always. Your efforts are indeed commendable. Excellent! There is no ending to the work done by His Highness the Aga Khan, We should all be happy. Thank you for sharing this wonderful detailed information and bless you!! Please keep updating us! Great Photos.. Reminded me of the good old days in Ottawa.. 🙂 Perhaps, time for a trip one of these days..